After a winter of waiting, I am back on the air on WAMC Northeast Public Radio starting this Friday, March 7, 2008 at 2 p.m. Joe Donohue will be the host and I will be joined by arborist Fred Breglia from the Landis Arboretum. Please tune in and have your questions ready. I can't wait! I called when you were on WAMC last week but got disconnected. I did hear you say to post questions on your blog so here I am. 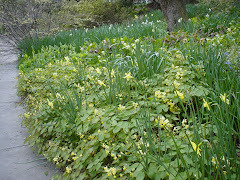 My question is this: can paper narcissus bulbs be kept and made to bloom again in a new season. If so, how can this be done? Sorry to report that unless you live somewhere south like the Carolinas, paperwhite narcissus bulbs will not bloom again here in the North. The only way to reuse forced bulbs is to plant them in the ground so they can replenish their food supply and bloom again next year. It is too cold to do it in the Northeast or MidWest.